Today he talked about religion. I am aware that this can be a very divisive topic among my readers – so I am not going to expound on it. I will say that I was superbly impressed on how his views on various religions as well as atheists has become nuanced over the years. 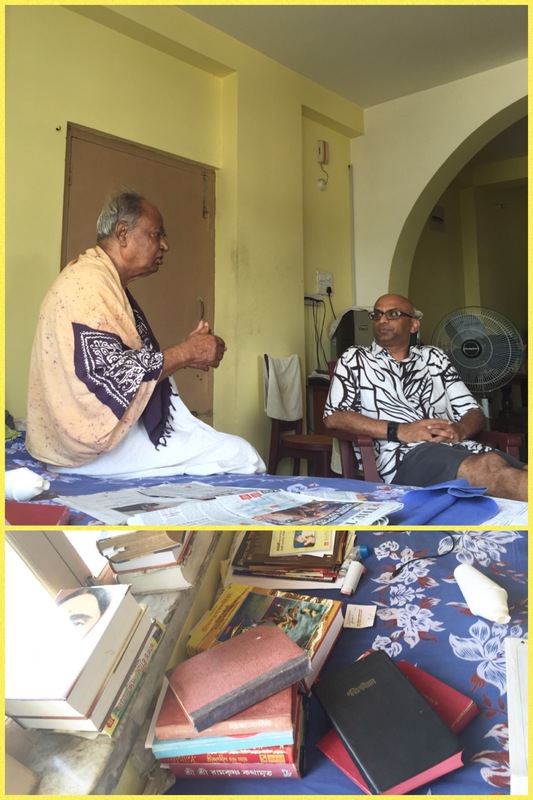 His bed is strewn with various religious books – you can see the Gita, a Bible, some books on Ramakrishna lying next to his inhaler and medicines! One humorous anecdote. He talked about Ramakrishna’s famous saying “Taka maati, maati taaka” (which basically denounces the focus on money – saying wealth is dirt, dirt is wealth). At this point, I interjected. To bring in levity I asked “Then why were you complaining that the banks are not increasing their interest rates for you?”. Not to be outdone, he continued with the same flow – “Etar abaar onno ekta interpretation-o hoy. Taaka thaakley maati – orthat jomi kintey paarbey. Abar sei jomir daam baarley aaro taaka paabey”. He gave another – and a rather convenient interpretation. He said, if you have money, we can buy dirt (land) and then as the price of land goes up, you make more money. I think I can deal with that religion 🙂 It was good to see that he has not lost his sense of humor!! It is always about the bottomline!! My dad, given his background, is ever worried about money. I remember my childhood days when he would try to cut as many corners as he could and fight for as many deals as he could get so as to save some more money. The only exception was education. When it came to the education of the three kids, he was ready to make the family go without food but he had to make sure we went to the best schools, bought all the books etc etc. Sometimes he would take it almost to an extreme. While it was very irritating then, I have a better perspective because I understand his background better. But sometimes it creates some funny situations. Like this morning. I figured he would like to see my other colorful shoes. 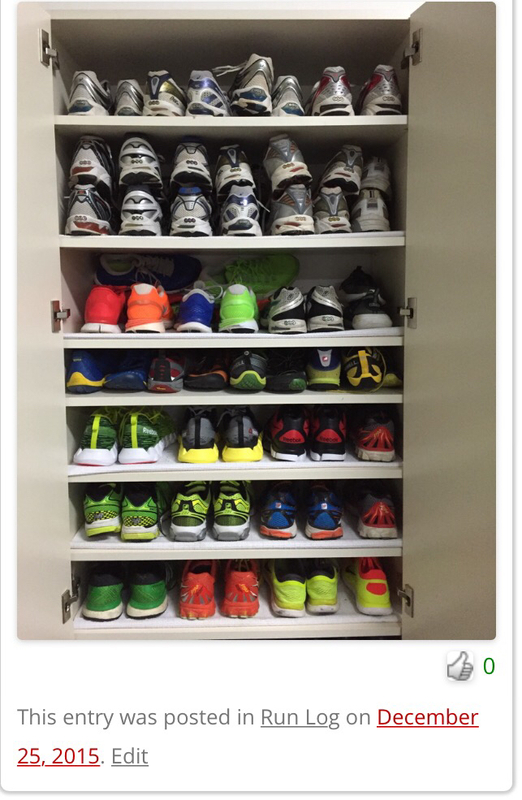 So, I fished out an old blog entry from my website and showed him my collection of colorful (and not so colorful) shoes. (picture attached). It took him some time to realize these are all my own shoes. And that I can’t use any of them for running after 300-400 miles. Therefore I have to go thru about three or four pairs every year. He looked at all the shoes and went “Baapre… baapre… baapre… baapre…. baapre…” like a recurring decimal. (Baapre is the septuagenarian’s equivalent of “OMG” ). I was then expecting him make some comments about all the different colors I have or even the sheer number of shoes I have accumulated. Instead, he quickly cut to the chase by summarizing the situation to its lowest common denominator. As he handed my phone back to me, he said “Lakh takar opor juto aachey”! Category: Vacations | 1 Comment on It is always about the bottomline!! 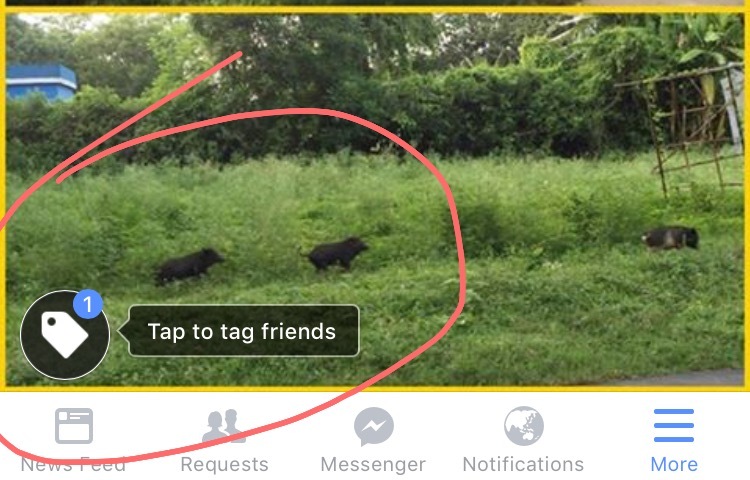 FB is asking me to tag my friends among the pigs that ran alongside me yesterday!! That was (almost) a new side to my dad! This morning’s three hour long conversation with dad (he spoke most of the time) was a little eye opener for me. Usually, the conversations become so negative about general state of affairs or a littany of his worries for my brother and sister that I politely find some excuse to do something else after fifteen minutes or at least attempt to force a change of topic abruptly. I was pretty sure he was going to bring up a few topics known to irritate me but I hung on. And I was glad I did. I learnt something. “Do not do any ceremonial things after my death”, he said. “Just cremate me and next day each one of you go back to your office and school. There is no need to call all relatives and friends and go thru the motions of shraddho”. (This is part of Hindu rituals after somebody’s death). “I have had a good life and there is nothing sad about me leaving the world. Don’t even try to shave your heads.” (again, this is a Hindu ritual for sons when their dads pass away). And then looking at me he said “Oboshyo, tomar byapar-ta alaada”. (‘You, of course, are a special case :-)’). I was internally going – “Now we are talking”!! I absolutely believe in what he said. He had a humble beginning and did what most folks always dream of – raising three successful kids and their families. He overcame a lot of odds in his life. He certainly set an example to three of his kids. When he leaves us, we can say with certainty that he was absolutely ready to. He fought hard till he could live life in his own terms. Such is a life to be celebrated not mourned after he passes away. I will drink to that! He then told me about an incident that has come back to visit him in his memories repeatedly over the last few years. The one time he went to America, apparently, Sharmila had taken him to a Walmart and there he saw a couple with four kids. He was confused why two of them had the same skin color as them and the other two were completely different. Sensing his confusion, Sharmila had told them two of them were adopted. That is why they were different but calling “dad” and “mom” to the same persons. As an aside here, I need to mention that adoption runs in our family too. In fact, my niece – who you saw having “foochkas” with me yesterday is adopted. My sister and brother in law adopted her from Mother Teresa’s orphanage after their natural process of having kids did not yield results. Reminding me of my sister, my father continued “Your sister adopted because that was their only option left. That family I saw in America – and it has taken me a long time to process this – did not do it because they needed to. They did it because they wanted to. Giving a kid – with an otherwise assured dead end – a gift of life – I cannot think of a higher human virtue. Especially when you already have your own kids”. That forty five minutes hit me very hard. People who know me are probably aware of how violently I am aligned to his points of views (save the government part). Having spent some time volunteering for an organization dedicated to battered women and kids, I came to see up close and personal how bleak the other side is. Fortunately, I have seen the other side too. I have friends who have adopted kids – some after having their own and some without. I have friends (I have written about one of them) who have adopted from multiple countries and in one case – with specific medical issues because they could afford the treatment in US for them (among other things). I even have a friend from Dallas who (she and her husband) had explained to me before they got married that they were not going to have their own kids – instead they were going to adopt kids. “Because there are more needy kids than caring parents in this world”, they had told me. I had an immediately flashback to that coffee meeting many many moons back as my dad kept talking. His final point was something he said he got inspired by a story of a lady he read in the newspaper. Apparently, the lady who died of a terminal illness donated both her kidneys and because of that two other patients got their lives back. Now, my understanding, while sketchy, is that it may not be as difficult or little known as he thinks it is in India. My general impression is that it might be less prevalent but it is easy to become donors. What I am not aware of is how good is the process of ensuring that the parts are secured within the stipulated period of time and all that. I think I need to discuss this more with my friends in India and then with him again. Regardless of that, I could not agree more with him about how not to accept death as the final arbiter of how long we can be productive human beings. We can – in some parts – outlive death, if we so choose to. In a very noble way, to boot. He was tired after three hours. He finally went back to sleeping in his cot. I got up from my chair realizing again that the apple never fell too far from the tree!!! Notice something funny with my mom’s phone dialpad? As it is my mom is completely oblivious of all the advances in phone technology. She does not even look up the address book to call somebody. She has no idea how to increase the volume while on a call. The only thing she has been trained to do is press the buttons (stemming from her land line days) and wait for the other person. Even that, looking at her phone, how she does it, I do not know. 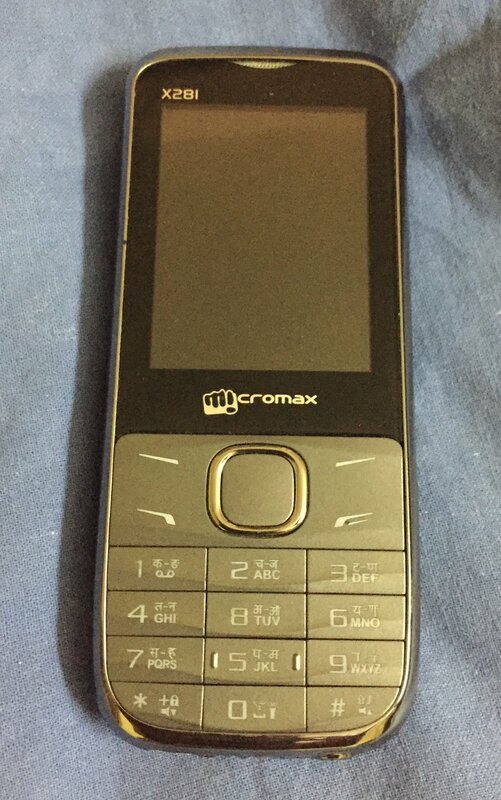 Looking at her keypad, I can only conclude that she has never attempted to make an outbound call!! And she has had this phone for at least a couple of years!! 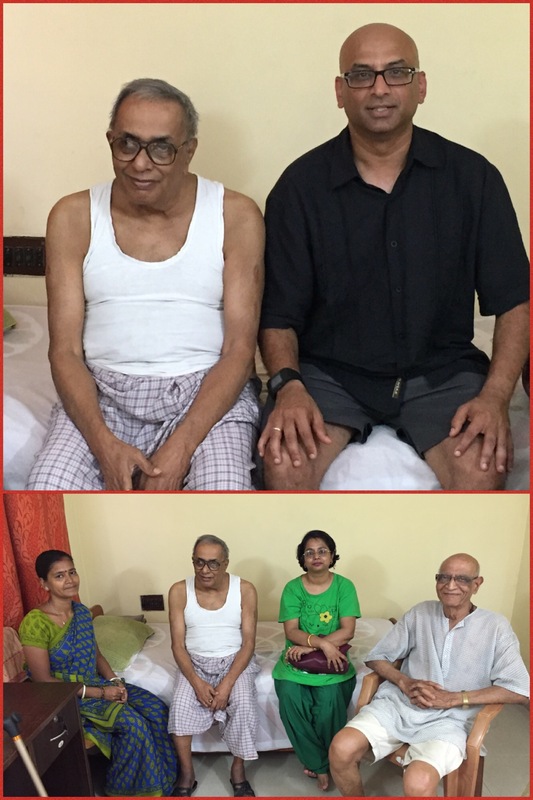 The two of us visited my friend – Satyaki Lodh’s – father who lives in an old age home about 30 minutes of drive from my parents. I met him for the first time three months back during my last trip to India. He seemed to be pleasantly surprised to see me. I was a little surprised that he remembered me. He is 89 and has memory lapses. But he softly told me that I am the only person he knows who knowingly shaves off his head. I agreed that he had a point there. Like last time, he was quiet most of the time. My sister, who was impressed by the old age home had a lot of questions for him. He answered them softly. But there was a common theme between him and my dad. He too, said that he has no reason to live anymore and would rather die peacefully. 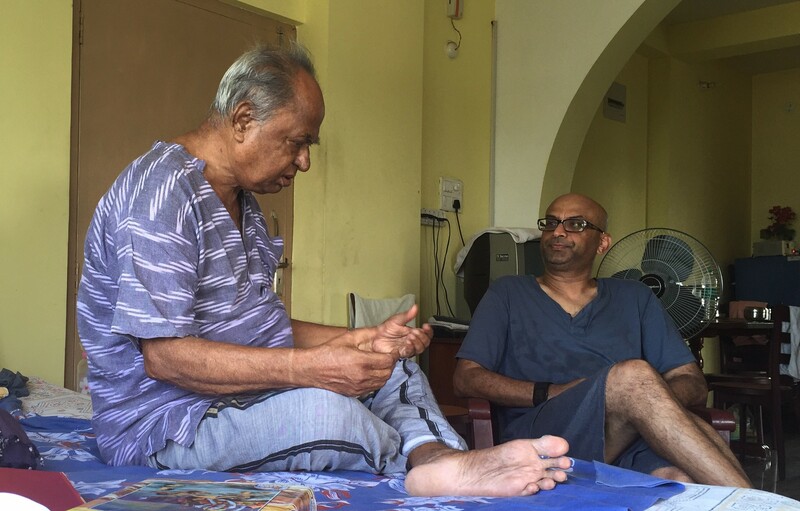 My dad is better this time but the lack of a purpose to live at an old age is a real challenge – at least among the few people I know in India. It was good to see Lakshmi – his attendant again. I need to write sometime about lifestory as I had learnt it and how she has fought thru her life to raise her two sons – who happen to be of the same ages as my daughters. 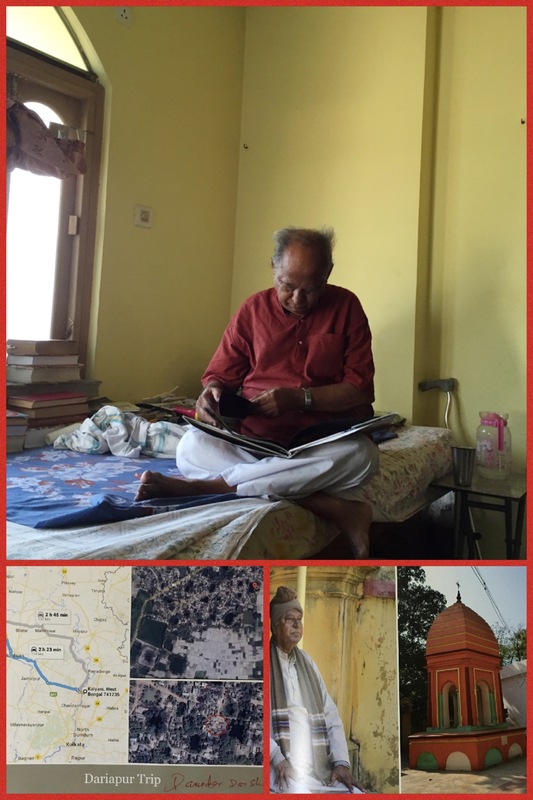 And I made a new friend too – Mr. Biswas who lives there with his wife. Their only son is in Germany. He did most of the talking till we left about an hour later. He had a lot to say and after some time I was not too sure if the quiet Mr. Lodh was enjoying all this or just waiting for us to leave him at peace. He did put that doubt to rest a few minutes later. Just as I took leave, the otherwise very quiet Mr. Lodh, told me “Abar eso porer baar. Bhalo laagey erokom du minute-er jonno-o dekha hole”. (‘Come by next time too. It feels good if you drop by even if for a few minutes’). I sure hope he meant it. Since I do plan to drop by again. No biz like shoe biz!! 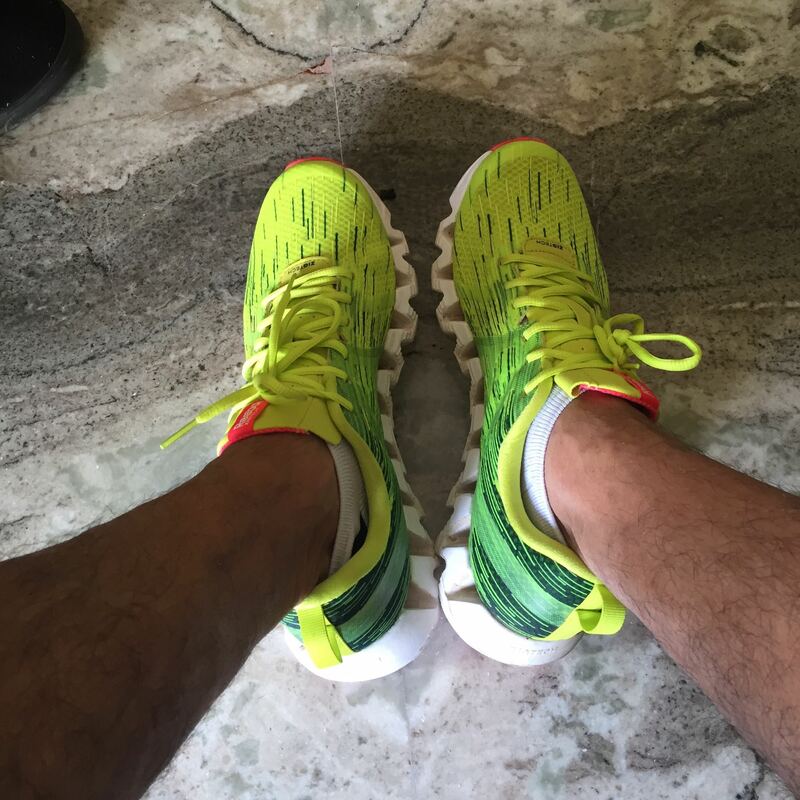 My dad has been gaga this morning about my running shoes. Multiple times he mentioned how great they looked. He even called my mom and showed her – “Dekho ek-i juto kintu duto sundor rong” (‘See, it is the same shoe but two different colors’). I asked him if he wanted a pair like that. He declined saying his ten year old slippers are still going strong. Just when I was feeling good about his approval, he threw in “Kintu moja duto tomay thhokiye diyechhe”. This is a old story – he thinks the shopkeeper in America cheated me by charging me for the full socks but gave me only upto the ankle!! This morning, it was just dad, mom and myself at home. 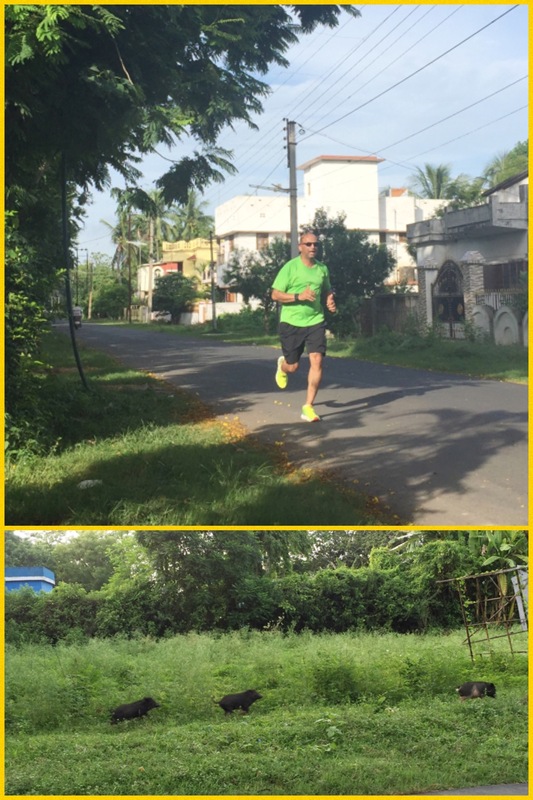 I did not even try to convince either one of them to go for a run with me 🙂 For whatever reason, a few piglets ran for some diatance with me for all their money’s worth!! Finally, my curiosity got the better of me. Very softly I asked my mom who was sitting next to me – “What is he reading?”. My mom then told me the whole story (loudly enough that it broke his concentration, but since he is hard of hearing, he did not follow the conversation anyways). About a year and half back, I was able to take my dad to visit his birthplace. That was after years and years of cajoling him. You can read about it in my blogs from Jan 2015. In any case, having lost his dad when he was two and a half years old, I guess property disputes led to his mom, elder brother and elder sister getting evicted by my grandma’s in-laws (society was cruel that way those days, I guess). He has very bad memories of being put in the streets and the long trek to my grandma’s brother’s place and losing his sister during the trek. In any case, the important thing was that he was able to get over his scars and visit his dad’s place and his birthplace. He was mesmerized to see the temple that his dad had built (my dad was even named after the same God that the temple was dedicated to). He even had pointed to the street that they had taken his dad’s body away on and how his mom sitting on the verandah and crying then. That trip, above all, lifted a big part of his mental block. I have always thought that it would go down as one of my biggest contributions to his late stages in life. But I did not realize that the story never ended there. You see, after I went back to America, I had picked about 50 of the best pictures from that trip and made a photo book out of it – you know those that Apple makes for you. To add to the memories, I had put in the Google map of our route and satellite pictures from Google Earth of the property and the temple. Little did I realize what special position that book has taken in his daily life. Apparently, he keeps it next to his pillow all the time. Once or twice a day, he pulls it out, my mom said, and spends hours leafing thru the pages. In front of me, twice he touched the book to his head (in Indian culture that is a show of respect). It would appear that those few glossy pages that Apple printed for me is his daily connection to his dad that he barely remembers and the temple that has stayed till date as their common connection. God knows what all thoughts he goes thru when he smiles or compares pictures in different pages. It did make me wonder what life is like without having a father to look up to throughout the formative stages of life. I have been lucky that I still have not had to face a day without my dad. I dread the memories of missed opportunities to show respect I might have when my Apple book gets printed.